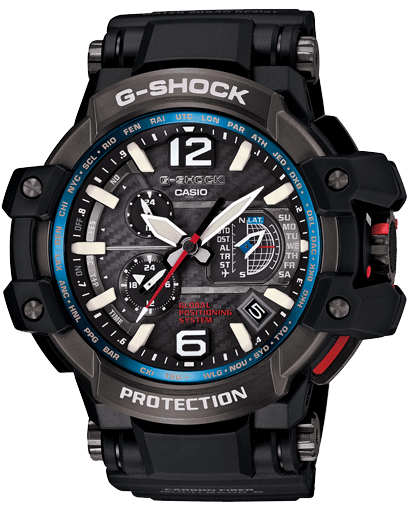 This Master of G buyer’s guide covers the current models of Casio’s flagship G-Shock series of professional-grade watches. The history of the Master of G line goes back to 1985 with the introduction of the mud-resistant DW-5500C which was nicknamed the Mudman. The Frogman first appeared in 1993 as a large ISO 200M dive watch featuring an asymmetrical case design and was the first official MAN series watch. It would see several design changes and feature some of the most iconic G-Shock cases. Casio indulged the collectors market with many limited edition models featuring unique color schemes. With the GW-200 series the Frogman was both a high-performing diving watch and a popular collectible. The Master of G line has always been about featuring the latest technology in G-Shock watches and that tradition continues with the current models. Master of G is also known as the “Professional Series” and consists of specialty watches that are targeted toward certain occupations and activities. Each model fits into one of three categories: land, sea, or air. Master of G watches are ruggedly stylish, and have a certain prestige among G-shock enthusiasts. It should be noted that with the exception of the G-9100 Gulfman and previous generation G-9000 Mudman, the current Master of G lineup is significantly larger and wider than standard G-Shock models like the DW-5600 or DW-6900. Those who are accustomed to larger G-Shock watches like the GD-X6900 or GA-100 will probably not find the Master of G watches too large. 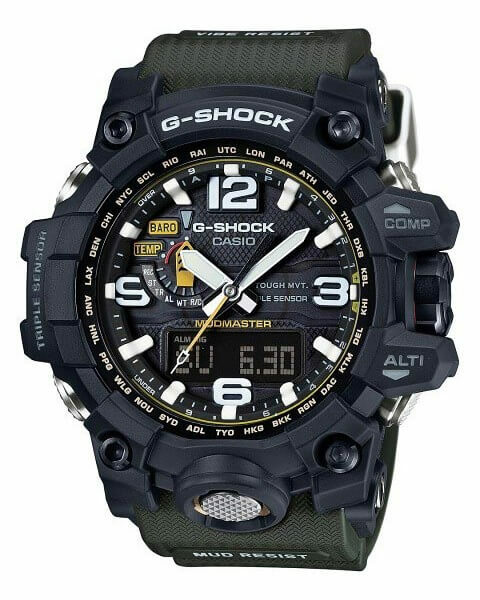 Expect all the Master of G models to have the usual G-Shock features like shock resistance, 200 meter water resistance, full auto EL or LED backlight, alarms, hourly time signal, stopwatch (1/100 second), countdown timer, world time, auto calender, 12/24 hour format, and button tone on/off. 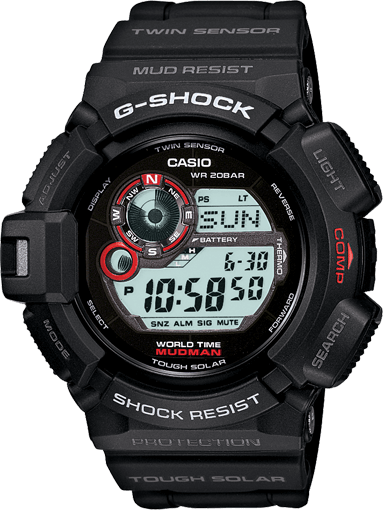 The G-9300 is the latest generation of the Mudman and adds Tough Solar, a digital compass, thermometer, and moon phase graph. In addition to being mud resistant it is also dust resistant. The missing feature here compared to the rest of the current Master of G lineup is Multi-Band 6 radio synchronization but we don’t think that’s a deal breaker since G-Shocks are very accurate and rarely need adjusting. There is also a Japanese model GW-9300-1JF (amazon) with Multi-Band 6 plus a carbon fiber insert band and keeper but it costs significantly more. The G-9300’s straightforward design, useful functions, and reasonable price make it a great watch for military use or for anyone who spends a lot of time outdoors. List price is $200. See a list of all Mudman G-9300 releases including special editions here. As the successor to the sensor-equipped GW-9200 Riseman, the GW-9400 Rangeman is a huge improvement in looks and is getting all the Master of G love these days. With its metal buttons, front-facing screws, and muscular build, the Rangeman looks like a G-Shock on steroids but it has the brains too. It’s billed by Casio as a survival watch and its standout feature is the Triple Sensor with altimeter, barometer, compass, and Thermometer. It also has sunrise/sunset data. The Rangeman is known for its unique sensor button with a metal cover for protection. Each sensor has its own unique beep so you can determine which mode you are in without looking at the watch. More specialty features include sunrise and sunset data, one touch time recording, and one touch elapsed time measurement. The Rangeman also has Tough Solar power, Multi-Band 6, and an LED backlight for illumination. In addition to its technical features the Rangeman is intended for those who expect their watch to take above average levels of impact and abuse. The Rangeman is also low temperature resistant to 14 F (-10 C). List price is $300. For all models including limited editions and imports see our list of every Rangeman watch released. The GWN-1000 Gulfmaster is the ideal G-Shock for boaters and those who spend a lot of time on the ocean. The Gulfmaster features analog hands and an LCD display, Triple Sensor like the Rangeman, and it also has a tide graph and moon age data. With its large round maritime design that takes some cues from the aviation line, this watch may not look like the typical G-Shock at first glance but rest assured it is with the usual shock resistance. It also has Tough Solar power and Multi-Band 6 radio wave time syncing. What makes this model unique from other resin-bodied G-Shocks is that the stainless steel bezel surrounding the glass is perfectly round and uniformly flat (though it does sit higher than the glass for protection), without any chunks of resin covering it. This gives the Gulfmaster a more refined look than the typical armor-like G-Shock. The Gulfmaster is one of the larger G-Shock watches but it looks a lot larger in print and wears comfortably with its soft band. The Gulfmaster’s unique analog-digital design actually comes from the Casio Pro Trek PRW-6000. They look very similar but the Pro Trek model is thinner, lacks shock protection and the tide graph, and only has 100M water resistance. The fact that the Gulfmaster has more features yet costs less than the Pro Trek is surprising and makes it look like a bargain. The GWN-1000 Gulfmaster has a list price of $500 and is available in a variety of colors. There is also a new Gulfmaster model, the GN-1000 with a list price of $300. This battery-powered analog-digital model has a Twin Sensor (compass/thermometer) instead of the Triple Sensor and does not have Tough Solar or Multi-Band 6. See every GWN-1000 Gulfmaster model released here. The current version of the beloved Frogman took on a significant design change from the long-running GW-200. Its partially exposed stainless steel case is reminiscent of the early DW-8200 design and it is significantly larger than the GW-200. Its price has also more than doubled with a list price of $700. What makes the Frogman so special? All G-Shocks are water resistant up to 200 meters but the Frogman has a screw-lock case back and is the only G-Shock with ISO 6425-compliant water resistance to 200 meters. Also the watch module is housed in a full metal stainless steel case under the resin exterior. The stainless steel bezel and case back are coated with a diamond-like carbon (DLC) coating, providing extra resistance to scratches and corrosion. The Frogman is also made in Japan, which makes it a prestige G-Shock and explains the higher price. The Frogman is one of the longest-running models and has always been a premier G-Shock. Its limited edition versions are some of the most sought-after watches by G-Shock collectors. 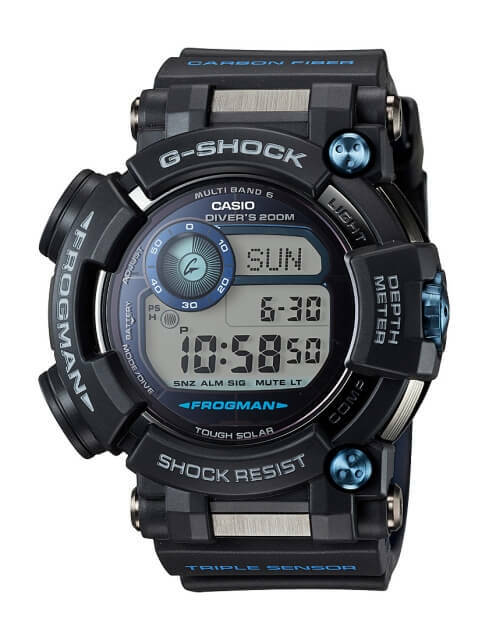 The current GWF-1000 Frogman has Tough Solar charging and adds Multi-Band 6 for the first time. It has tide and moon phase graphs and data memory for up to 10 logs. The simplest way to describe the Mudmaster is as an upgraded Rangeman in a tactical analog-digital form. It has a similar mud-resistant guarded button structure with gaskets in the cylinders and button shafts, and a screw lock crown. It also utilizes Alpha Gel at key points to add resistance to extreme vibration. It has a Triple Sensor Version 3 to measure direction bearing, temperature, altitude, and barometric pressure. 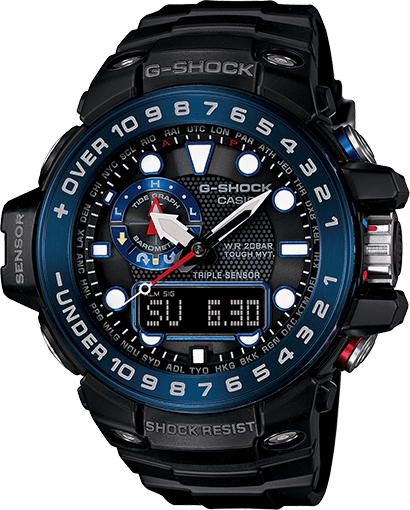 Like other top of the line analog G-Shock watches it has a sapphire crystal. List price is $750. Perhaps the main thing that has caused all the excitement about this watch is simply the way it looks. Until now, the high-end G-Shock analog watches have been aviation and luxury models. The Mudmaster is very big and tough-looking with its military-inspired styling. It is essentially the first G-Shock of its kind: the high-end tactical analog G-Shock. The highly anticipated second-generation GPR-B1000 Rangeman was released in 2018. The uniquely large LCD display is capable of rendering graphics and maps and represents a new direction for G-Shock watches. The new Rangeman is equipped with both GPS tracking and Bluetooth mobile connectivity. It can display the current location on a preset route or the bearing toward a destination as well as record track and point data. The GPR-B1000 is the world’s first solar-assisted GPS watch and is also chargeable with a wireless adapter featuring a micro-USB connection. Previous features like mud resistance, the Triple Sensor (altimeter-barometer, compass, thermometer), and sunrise/sunset data are still present, and a tide and moon graph is now available. Hardware upgrades include a carbon fiber insert band and a sapphire crystal. The GPR-B1000 offers everything the GW-9400 did and much more, making it the ultimate survival watch and one of the most advanced G-Shock watches. The GPW-2000 Gravitymaster is the current top of line Gravitymaster aviation watch. It was first released in May 2017 with a surprisingly lower list price than the previous generation GPW-1000, despite having more features. Like the GPW-1000 below, the GPW-2000 has GPS hybrid timekeeping, Triple G Resist, a sapphire crystal, and a carbon fiber insert band. New features include Bluetooth connectivity to a smartphone and 3-Way Sync so the watch can adjust the time automatically with internet time servers. The GPW-2000 also has GPS positioning tracking through the G-Shock Connected smartphone app and latitude/longitude information on its display, handy features for pilots or emergency situations. Another new feature is a screwless band structure that will not come loose from vibration. 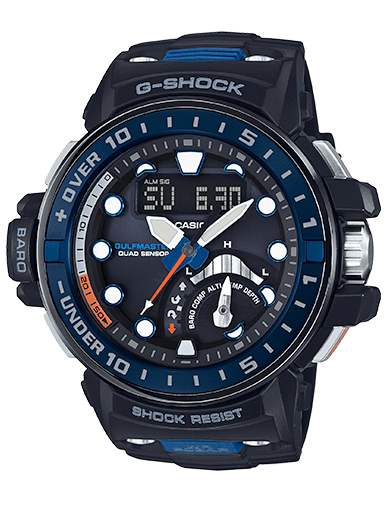 The heavily upgraded GWN-Q1000 was launched in 2016 and is the first G-Shock to be equipped with a Quad Sensor which includes the altimeter, barometer, compass, thermometer, and now like the GWF-D1000 Frogman, a water depth meter for diving. Like the previous GWN-1000 Gulfmaster, this Tough Solar/Multi-Band 6 watch also has a tide graph and moon age data. Other key features include sunset/sunrise data and a carbon fiber reinforced case. List price is $850. The Gravitymaster name refers to several G-Shock aviation watches with the GPW-1000 representing the top of the line. The GPW-1000 is known for being the first G-Shock with GPS hybrid timekeeping. If the watch is out of range of the Multi-Band 6 radio transmitters, it can still sync the time through the reception of GPS satellite signals. It can also determine the time zone and DST setting automatically. This means the watch can sync anywhere in the world and makes it a good choice for world travelers, adventurers, and those living in remote locations. The GPW-1000 also has Triple G Resist, offering resistance to shock, g-forces, and heavy vibration. While its large analog display has the look of an aviation watch, its resin frame and resin band with carbon fiber insert makes it a rugged watch suitable for the outdoors. 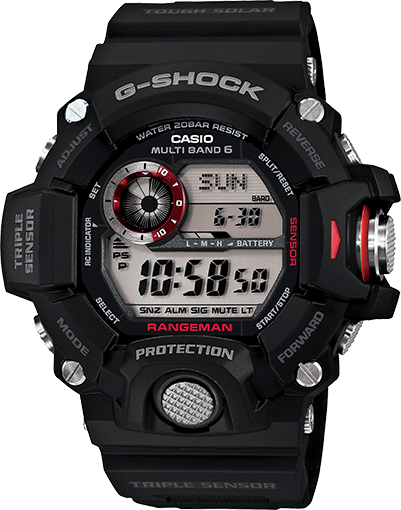 It also has a sapphire crystal and unlike other higher-end G-Shock aviation models, an LED light. See every GPW-1000 Gravitymaster model ever released here. The new GWF-D1000 Frogman was released in the summer of 2016 and features a new kind of Triple Sensor with an underwater depth meter, compass (that works underwater), and thermometer. Like the previous generation GWF-1000 it has tide and moon data, a full stainless steel inner case, and a screw-lock case back. Other new additions include a carbon fiber insert band and a sapphire crystal. The new Frogman is now one of the most expensive G-Shock watches but the new features represent the largest upgrade ever for the series and it is now one of the most technologically advanced G-Shock watches. With the release of the GWF-D1000 it is likely that the GWF-1000 may be discontinued but current stocks should maintain its availability for a while. G-Shock USA is listing many Gravitymaster aviation watches in its Master of G lineup, including the GA-1000, GA-1100, GWA-1000, and GWA-1100. To avoid redundancy we are keeping those models in our G-Shock Aviation Watches Guide. Previous Master of G models that are still available include the G-9000 Mudman (amazon) and the rust-resistant G-9100 Gulfman (amazon) with titanium metal parts. Compared to the other Master of G watches these models are a smaller size that are more in line with the G-Shocks of the 1990s and 2000s. Based on this feature comparison, I don’t see how anyone would chose the GWG mudman, based on FEATURES. Looks maybe, but not features. What if someone sell gwg 1000 and gpw 1000 at the same price,which one will you choose? Probably the GPW-1000 if they were the same price. I want to buy GPW 1000, but I want to know about GPW-1000 Strap Band, is it made from carbon fiber? if it made from resin, it is strong enough for long time period? The Mudmaster GWG-1000 does not have a carbon fiber insert band but it is strong and should last a long time. The Frogman has 200M water-resistance that is ISO-compliant, but that probably doesn’t matter much unless you are diving to extreme depths. The screw-lock case back of the Frogman is considered to be a superior and sturdier design over the Rangeman’s case back with its four point screws, and the Frogman is one of the only G-Shocks with that feature. The body is also full stainless steel (by the body I mean the part beneath the resin bezel which houses the module and display). Also the Frogman is made in Japan. For technical features you are not really gaining much other than the tide graph and moon chart, and it is more of a build quality upgrade in this case. Seems like a good time to buy it as the prices are at an all time low (with the GWF-D1000 on the way) and the GWF-1000 will likely be discontinued soon and might be difficult to find later. Which is a better option to purchese between Mudmaster GW1000 and Rangeman GW9400? I am getting both for almost same price. If it’s the same price then it sounds like the GWG-1000 is a better deal. Hi, first of all, GREAT WEBSITE!! I was wondering, wich one is better the mudmaster GWG1000 or the gravitymaster GPW 1000?? And do you know if the mudmaster GWG1000 comes with a carbon fiber band? Much Appreciated your very informative review. I just want to know if you have an idea if there is a new upcoming master of G watch coming this 2017? Rangeman was created last 2013. Mudmaster in 2015. I don’t know at this point, but I wouldn’t be surprised to see a Rangeman update sometime soon. I own both the Gravity Master and the Mudmaster. Both are amazing watches. But as far as looks and comfort of wear, the Mudmaster is king, even though it is cheaper. It just looks GREAT. And I believe many others feel the same way, as there is more said about the Mudmaster. At the end of the day, it’s best to visit an authorized dealer and try both of them on. Only then will you be able to compare. Note: the Mudmaster is much more comfortable on the wrist. I love it. 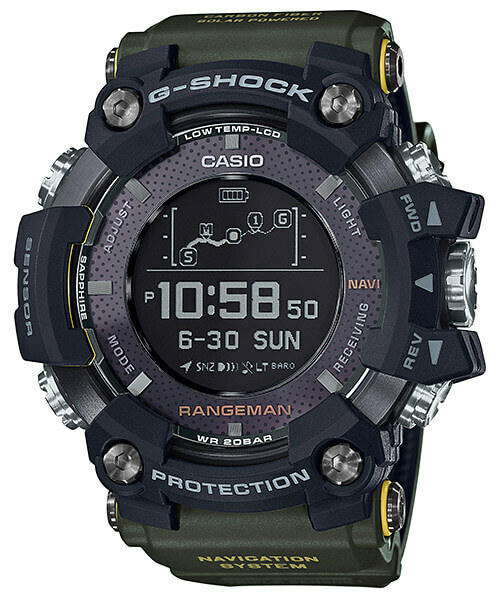 I’m sure I’m the thousandth person to ask, but I need help deciding between the G-9300 Mudman or the GW-9400 Rangeman. I’ve read almost every review and watched every video but I just can’t decide. With only $100 separating the two, is the Mudman really that inferior of watch? I’ve never had good luck with the atomic feature on other G-Shocks (I live in southeastern North Carolina) and I don’t hike. However, every review I’ve read says the Rangeman is just all around better, especially at a similar price point. I’m also concerned about accidentally hitting that sensor button constantly during routine activity, but I don’t want to buy the Mudman and regret it instantly. I also don’t want to spring for the Rangeman and be constantly frustrated that I can’t get an atomic update or keep hitting that button. I’m a cop, and lead a moderately active lifestyle. I want to wear a watch and not have to worry about it. I want it to work, in all environments, all the time. Thanks so much for your help, and excellent website! I don’t think Mudman is that inferior unless you really need the pressure sensor (altimeter/barometer) or sensor logs. I was also thinking about buying these two watches and I went with the G-9300 because I didn’t need all the sensors and wasn’t in range for Multi-Band 6. Also I felt the Rangeman was a little big for me and I liked the Mudman’s simpler look. I don’t think hitting the sensor button accidentally has been a problem for most people. Another advantage of the Rangeman is the front-facing EL backlight button, though both watches have the full auto EL backlight feature, meaning you can set them to activate when you turn your wrist to look at your watch (and “full auto” means it will only activate in the dark). If you can I would suggest trying to see the watches in person (maybe at a Macy’s) to help you decide. This is the ultimate top gun king of all G-Shock watches ..
Is the Gravity Master the largest G-shock watch currently available? 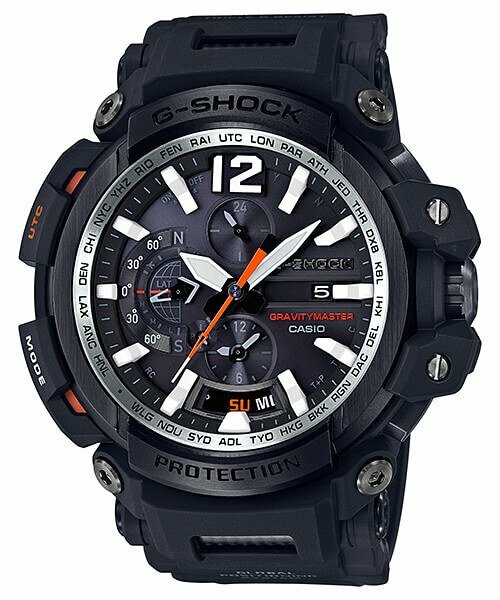 I’m interested in the largest G-shock either from the Master of G Series or any other. Thanks for your awesome website. Yes I believe the GPW-2000 is the largest and slightly larger (1.1 mm wider, but 0.6 mm thinner) than the GPW-1000. Also the GWG-1000 Mudmaster is one of the largest G-Shocks but the GPW-2000 is 1 mm wider. Great reviews on the Master of G watches. I have the GPW 2000, the GWN-Q1000 and the GWG 1000. Among them the Mudmater is my daily go to watch because of the looks, design, features and robustness. Do not under estimate its cheaper price among the three. Should i buy a gwn-q1000 (mc) or the gwg-1000 ??? Have heard that the quad sensor is discontinued??? Is buying the quad gulfmaster a wrong desicion? Considering the problems some people are having with the GWN-Q1000 Gulfmaster I would probably go with the GWG-1000 Mudmaster. 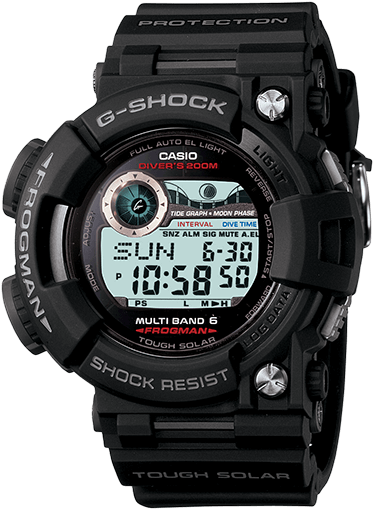 i am actually struggling between the Frogmam GWF-D1000 and the Gulfmaster quad sensors GWN-Q1000. Have you the possibility to test which one of them has got the louder bip/alarm sound, please? Thank you for your time and your great website!